Sending cool birthday poems is the coolest way to wish a special "Happy Birthday" to your loved ones. The only thing cooler? The collection of cool poems on this page. Of course, you wouldn't want to send a poem that's just cool. That would be a rather cold birthday message. When you select a poem with more than just the "coolness" factor, it simply gets even better as a birthday message...of hope, support, faith, inspiration, whatever you want it to be and whatever will make the birthday boy or girl feel super special on his or her birthday. If you're looking for a definition of uncool, cool or too cool, you will need to look inside yourself for some guidance. That's because there's no one-size-fits-all definition for cool. Cool is something you define yourself because one person's "cool" is another person's "uncool." "Not cool enough" birthday poems: Poems that are cool for other people but lack the "coolness" factor (as described right below) for you (and likely for the birthday boy or girl). Cool birthday poems: Poems with the "coolness" factor — poems that both send a shiver up your spine and pull at your heartstrings (and are bound to do the same for the birthday girl or boy). This is the "sweet spot" when it comes to cool birthday poems. "Too cool" birthday poems: Poems that are so cool that they are "cold," lacking the sentimentality that can make birthday boys and girls feel special on their birthday. As you can see, "cool" is something you need to define not only for yourself but also the birthday boy or girl. 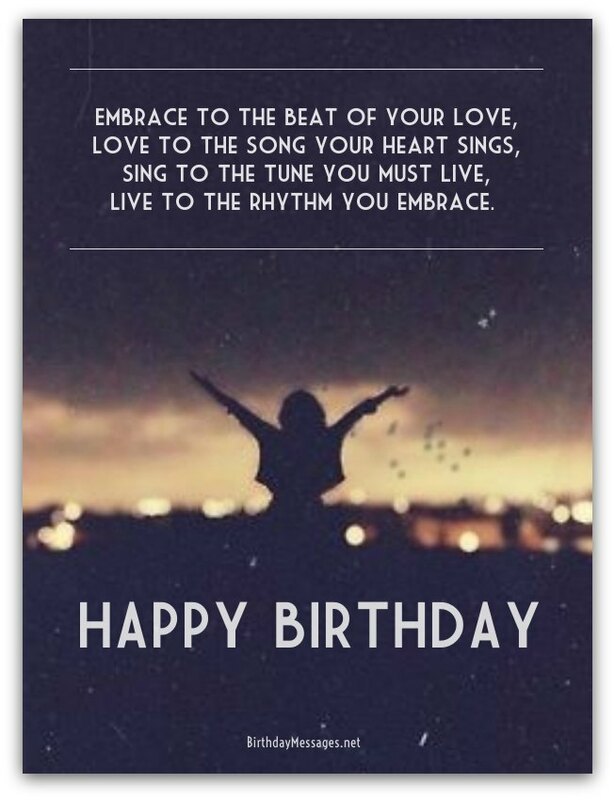 To choose the best cool birthday poems for your loved ones, you therefore have to select those that satisfy the cool barometer of both you and the birthday girl or boy (based on what you know about him or her). The very least of your wealth. Come instantly back to you. The "will to live," as a birthday message, can be slightly heavy handed if handled incorrectly. But it doesn't have to be. In Resume, one of my favorite cool birthday poems, Dorothy Parker literally makes a rhyme out of a list of suicide methods, dismissing each method as inadequate along the way, only to come to the conclusion that "you might as well live" (you might as well "resume" living). 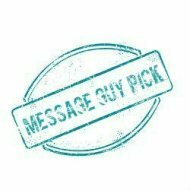 Resume offers a cool way of telling a birthday boy or girl that life is the best option and you should enjoy it to the fullest. As one of my favorite cool birthday poems, I think it would make an excellent birthday message for someone who likes anything that's hip, and tongue-in-cheek. What would make a cool birthday wish to add to this poem? How about "Here’s to the good life! Happy birthday!" I thank the stars you were born. My love would be forlorn. Making my life more real. Most of us have dreams, both silly and serious, we would love to come true. Birthdays, as you well know, are the perfect time to send a birthday poem that cleverly describes what life is really like without your dreams to keep you sane and content. Dreams is one of those cool birthday poems that shows you the upside of pursuing your dreams by clearly (and lyrically) illustrating the downside of deferring them. Its images of a barren life could make anyone on the verge of making their dreams come true to soldier on. For cool birthday girls and boys who love "cool" stuff, Dreams is the perfect birthday message. 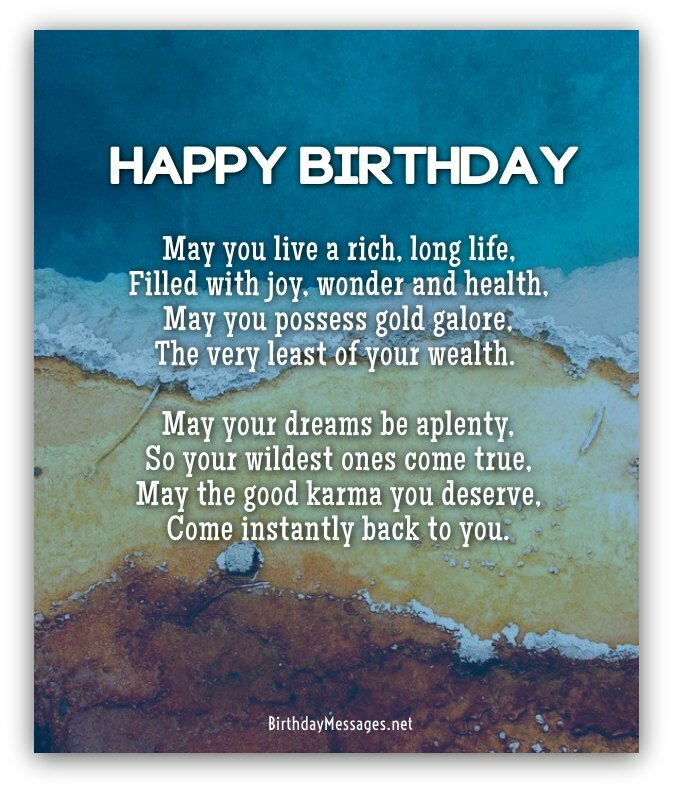 If you would like to add your personal touch to the poem, consider adding this cool birthday wish: "Happy birthday! May you pursue your dreams and live in a world with only sure-winged birds and lush fields." As well-laid plans come true. Written in a Carefree Mood by Lu Yu is all about aging beautifully — not just gracefully. This makes it somewhat of a rarity in a universe of poems that often portray getting old as a sad experience packed with regret, loss and anger. What makes Written in a Carefree Mood one of my favorite cool birthday poems is its playfulness: instead of looking at aging as the end of life, it concentrates on enjoying our time on earth, right to our last breath. The main (and only) character in this poem is, in my opinion, a truly cool, 70-year-old man who spends his days enjoying the simple things that make life worth living, never wallowing in misery over the past. This is exactly the type of person who should receive this poem (purely as encouragement) as a birthday message. 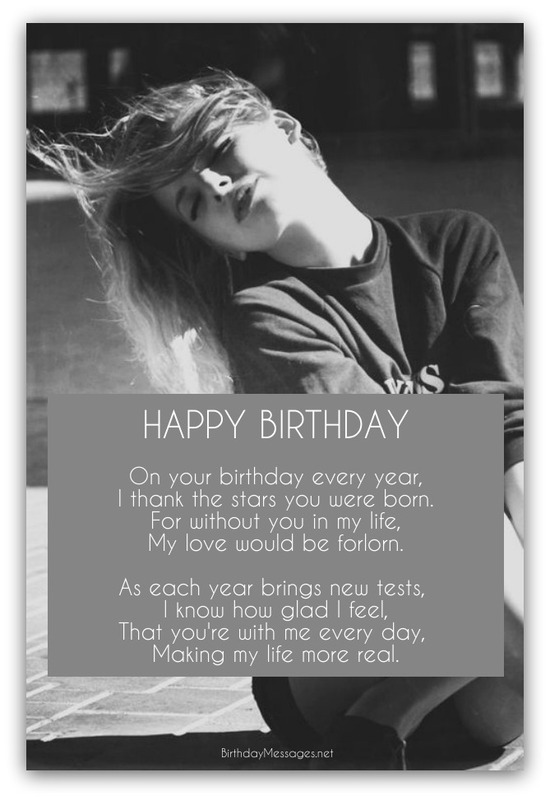 Want to add your personal touch to the poem with a cool birthday wish? Try this one: "Happy birthday! Here's to never apologizing for your joie de vivre." He first set out to school. So don't drive yourself mad. Get down while you can. Live to the rhythm you embrace. He tells her that he will always love her just as much as he loves her now. The second one especially works well as a birthday message because it can be interpreted as a poem about any young couple looking forward to what their future together may hold (hence, my Grow Old with Me earworm). Because it's about a love that can last decades, When You Are Old is an ideal birthday poem for your significant other. But it does need a little bit of your personal touch. Nothing too complicated — just a cool birthday wish, like this one: "Grow old with me. The best is yet to be. Our love is forever bound. Happy birthday! Amid a crowd of stars.